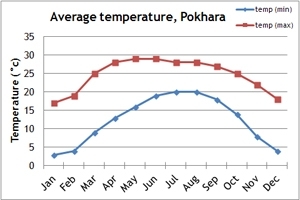 When is the best time to travel to Wild Nepal? 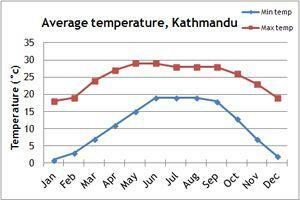 Our temperature and rainfall charts will give you a guide to the climate in Nepal. 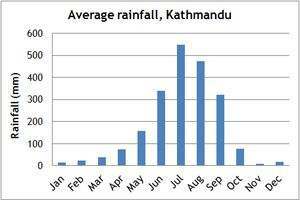 Like the ever popular Annapurnas and Everest region, the spring and autumn months are considered the best time for trekking in many of the more remote areas of Nepal. In spring, the start of the trekking season finds beautiful rhododendron and magnolia in full bloom along the trails. Whilst in autumn crisp, clear skies enhance the mountain views and the countryside is green and lush, following the summer monsoon. Ganesh Himal and Manaslu in northern central Nepal and Kangchenjunga in eastern Nepal are all excellent destinations for spring or autumn treks. 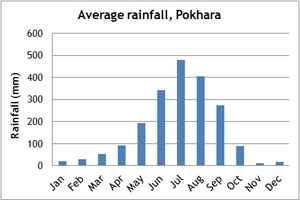 In summer, from June to August, much of Nepal experiences the monsoon rains. We consider that some destinations, such as Everest Base Camp and the Annapurnas are unsuitable for trekking during this time of the year; internal flight schedules can be affected and the mountain views are limited, even if the trails themselves are fine for trekking. However, Mustang and Dolpo lie in the rain shadow of the HImalaya making the summer months the perfect time for a trekking holiday in these spectacular and distinctive regions. If you would like to discuss your group or Tailor Made holiday to Nepal with one of our destination experts, then please call us on 01453 844400.